We have had a great start to the academic year! The new players on the club show a lot of promise and it's awesome to introduce new players to the competitive side of disc golf. We have been running a lot of clinics at practice and there have already been dramatic increases in skill for a lot of people. This is good as tryouts for the collegiate tournament are just around the corner! First tryouts begin 10/23 and will take place in Conifer and Bailey CO. Hopefully the weather will be cooperative! In other news the Ace Race fundraiser was quite successful! We raised about $450 for the club which is about a plane ticket for a member of the club! More fundraising tournaments are in the future including the next month or so. More correspondence regarding these tournaments will be posted as more information becomes available! CSU Disc Golf Club's Ace Race Tournament is Back!! 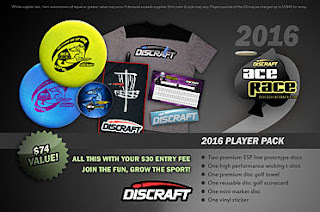 It is that time of year again where the CSU Disc Golf Club will be hosting a Discraft Ace Race fundraising tournament to assist in the clubs ambitions of going to the National Collegiate Disc Golf Championships. Going to this tournament is a big deal for our club as it gives our members the honor of growing the sport at a collegiate level. This year is a big year for the club as there are a good amount of new members joining our ranks and it is important for CSU Disc Golf to be actively engaged in the Fort Collins disc golf community. The Fort Collins disc golf community has long been a faithful supporter of our club and we want to continue that great relationship. This year people will be seeing our club all over the place whether it be volunteering in the community or just a casual round at the course. The 2016 Ace Race Players pack is bigger and better than last years coming with a variety of disc golf apparel. The Ace Race disc this year is a disc that is said to be beginner friendly, yet should be appealing to experienced players too! The disc is driver/midrange hybrid probably similar to a slower Lat 64 River or Innova Teebird The disc features the new premium Discraft ESP plastic. Included with the TWO discs that come in your players pack, are other disc golf paraphernalia such as; a high performance wicking t-shirt (colors & styles may vary) where sizes may be selected at registration. Also included are; one premium disc golf towel, one reusable disc golf scorecard, one mini marker disc, and one vinyl sticker. This players pack is listed at a 72 dollar value which is insane! Payouts for this tournament will be prize only and will feature a variety of options due to the various donations we have received from our great sponsors. The pay out scale and specific pries will be determined day of as the list of prizes we have is ever changing and will not be finalized until the day of the tournament. Registration will close on September 14th due to the order for the players packs needing to be submitted at least two weeks before the tournament date. There will most likely be a few extra players packs ordered so if you want to sign up but the registration deadline has already passed then please email the TD at the email address provided below to see if we can still get you in this guaranteed to be fun tournament! Any additional questions can be directed to Maverick Robertson at mfalcons777@gmail.com or by cell at 619-857-6576. We look forward to seeing everybody out there! This summer is going to be an important, busy summer for the CSU disc golf club. This club has the potential to be a bigger club with more members and influence in both the sport of disc golf and CSU. We encourage anyone attending CSU to try out for the club to better their discing abilities and join a fun club who want to make an impact on the ever more popular sport of disc golf. Last April, our club did not fare too well in the championship division at the National Collegiate Disc Golf Championships due to a variety of reasons. This upcoming year looks much more hopeful however, because our first flight team was able to take the defending first flight champs, Ferris State, to sudden death playoff after four days of fierce competition. Though we lost in the playoff, the strong finish at second place demonstrates the young talent on the team ready to take on the challenge of trying out for the championship division next year. The CSU Disc Golf Club will be hosting a fundraiser tournament in late August but the dates have not been finalized quite yet so you will see the information regarding that in a later post. In other news, the Colorado State Disc Golf Club is excited to announce the arrival of our new sponsor, SAVAGE. They are a clothing apparel company who are invested in multiple sports including disc golf. SAVAGE has a great selection of customizable jerseys and polos and we are ecstatic to represent them! Finally, the tryouts for next year are going to be a bit different in years past as we will have to qualify for the National Collegiate Disc Golf Championships so we will be attending a qualifier in Emporia, Kansas. This is an exciting opportunity where we will be able to be more engaged in the competitive collegiate environment. The details regarding this qualifier will also be addressed in a later post as Kansas University, the host of the tournament hasn't released details about the tournament.